Along the banks of the Mississippi river, 50 miles southeast of Saint Paul, is Red Wing, Minnesota. 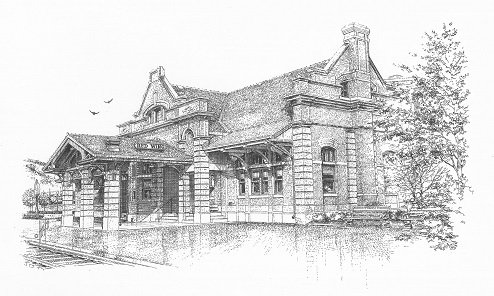 This handsome little train station (1904) was constructed for the Chicago, Milwaukee and St. Paul Railroad. Restored in 1990, this structure is just one of many architectural treasures in this historic river-town. During much of 2002 on into early 2003, the artist lived each weekend in Red Wing - Saturday mornings Bill would catch the eastbound Amtrak train from Saint Paul to Red Wing. 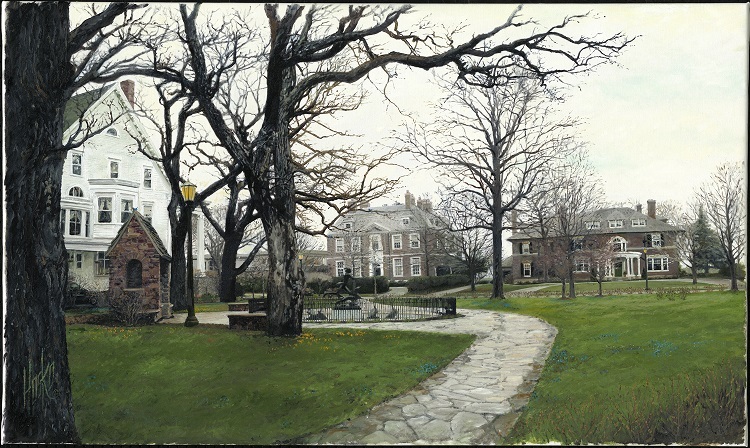 From here he would walk a mile up from the train Station, located along the Mississippi River and just behind the famous St. James Hotel, up to the top of Potter Street, halfway up Sorin’s Bluff, to his little 1854 house he had restored into a gallery/retreat overlooking the town. Sunday evenings, he would catch the westbound Amtrak train back to Saint Paul. Along with this illustration he created four other Red Wing artworks during this time: Prairie Winds House, Red Wing Depot II, Sheldon Theater and First Lutheran Church.